I was surfing the net yesterday when I saw this article on North America’s shark beaches. I will be the first to say that sharks normally do not attack people. I was impressed by the article’s view on that, citing research and evidence. As you remember, I have written informative shark posts on my blog here and here. I still believe that we can learn from these animals. Sadly, like the article says, human paranoia helps a lot in discrediting the shark. One story filled with terror, one high-budget Hollywood production is all it takes for people to shut their ears and scream. It is hard to be logical when you are afraid, but we can do it. Humans fear what is out of their reach. This doesn’t mean that I approve of shark attacks. We simply have to accept that it is part of nature. Lightning is more likely to strike you than a shark biting you, but we don’t make a big fuss about it. 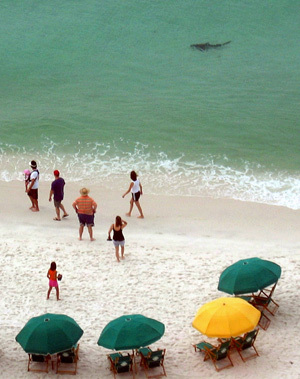 Shark attacks make for more headlines. What is the point of this? Just education and information. Knowledge is power, and the more we know the less we fear. Everyone should try and know as much as they can.